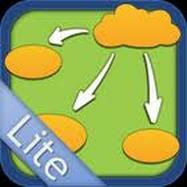 Inspiration Lite - All about apps in YOUR classroom! Just in time for school to start! This is the perfect thinking map app. Just create any thinking map and save it for later use or email it to yourself as a PDF for posting on your website or easy printing. The app is user friendly so files can be shared with other apps on your iPad (i.e. Pages). There are 26 easy to use templates or start from scratch and create your own. Pictures can be added to enhance presentations. There are even outline formats so you can teach your students how to write a genuine outline. Not only that, but the outline format can be converted to thinking maps, and thinking maps can be converted to the outline format! However you choose to use Inspiration, we would love to hear about and see your examples! Email us for student or teacher samples that you are willing to share or to ask us for more information.